“Chinese Ministry of Commerce and Guizhou Provincial People’s Government will co-sponsor The Fourth China•Guizhou International Alcoholic Beverages Expo （Hereinafter referred to as The Expo）with the approval from the State Council of China. The Expo aims at building up a platform for the global alcohol industries with the theme of Cooperation on Global Drinks. It also opens a door of Guizhou to the world to show the province’s environment…” From Guizhou Provincial Government announcement. Guiyang is a newly developing provincial capital and is pushing hard to establish itself as a tourist destination. They are using the Wine Expo to promote both tourism and the newly developing Chinese interest in the grape wine industry. 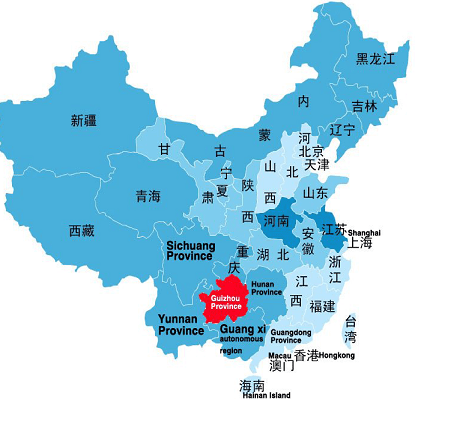 Guizhou is the home of Moutai Corporation which makes the most popular liquor in China. The Guizhou Government is providing incentives for foreign wine companies to exhibit their wines and learn about marketing to China. There is a subsidy available. Also, up to 60 bottles of wine will be shipped to The Expo at no charge to the exhibitors. Wine exhibitors must arrive in China between September 2nd and 7th. Exhibitor kiosks will be provided at no charge to the exhibitors. Travel arrangements are being made by Guizhou Overseas Travel Corp. Ltd (GZOTC). There will be three or four days in Guiyang, participating in the event, and another five or six days travel around Guizhou. Package details will be provided if Michigan Wineries wish to participate. The entire trip is expected to take the first two weeks of September and will include suitable tourist destinations. The Guizhou Government will provide approximately $1,500 to partially offset travel and accommodation expenses. Airline tickets alone should cost about $2,000 per person and other expenses could be between $1,200 to $2,000 depending on the size of the group and where they go within Guizhou Province. September 8 to 12 exhibitors should stay in Guiyang in support of The Expo. Tourist attractions could be visited within Guizhou Province before or after The Expo. GZOTC can customize trips throughout China if exhibitors have an interest and the time. The wine industry in China is very young, and growing rapidly. Michigan wineries are seeking credibility in the world’s wine industry, and The Expo may be a suitable opening for marketing to China. We can showcase Michigan in China. Certainly it can provide exhibitors with a unique China visit, with partial reimbursement as well as a possible deduction. In order to secure the subsidy, kiosk, and ship the wine, applications must be completed quickly, by mid-July. Interested persons should contact johnsporter@gmail.com as soon as possible to begin the process. Guizhou is an interior province that is mountainous, has abundant water resources, and natural scenery. The subtropical location and mountains combine for a very moderate climate. It is a “Forest City”. There are many minority villages with fascinating lifestyles in the region..
All wine samples should be cleared from China Customs in Guiyang. Exhibitor could start to fly back to his country or other place. I have been living here in Guiyang, China for nearly 7 years out of the last fourteen. I’ve been coming to Guiyang exclusively over that time as an English teacher. I’m now teaching at Guizhou Normal University of Guiyang. I still maintain a real estate appraisal business in Traverse City, using trusted friends to do most of the work. I am fascinated by this life and the lifestyle of my Chinese friends. Good jobs are not plentiful in China and graduation from a credible university is deemed to be the key to getting a good job. The greatest single factor in getting into a credible university, often perhaps the only factor, is an excellent score on this exam. It is tough on children and parents alike, especially parents. In a land where one child per family is the law. Many believe that performance of a child on these two days determines success or failure . . . of the parents. Perhaps it sounds tongue in cheek, or an exaggeration, but the above paragraph has been reviewed by many educators in China, and it’s not an exaggeration. I know a leader in the community, a person that was a director in local government and the headmaster of one of the best middle schools in Guiyang. In 2000 I knew her to be middle-aged and soon to be old. When I returned to China in 2010, after not seeing her for years, I ran into her. She was lovely and relaxed. She seemed ten years younger to me (not 10 years older). I told her so and asked what had happened to her. She said that when I knew her in 2000 her son was in the middle of taking the Gao Kao exam. She wasn’t sleeping well then and was very worried. Now, after success on that exam, and a successful college performance at a credible university, her son is a doctor. I am writing this log entry a couple weeks after these two days and the internet is off, as the result of a reported equipment failure, off for nearly two weeks to my place. The campus internet is adversely impacted because the IT guys are concentrating on keeping good internet performance in the classrooms where the tests are graded. Good internet is essential for nationwide reporting of exam results. We just have to wait. After the grades are in, it is expected that the internet will be turned on again. Last year I watched a TV talk show about this time of year. Every year it is discussed whether the one chance one test system is best for China. Every year they suggest changes be made, but it has been just too difficult to change. There is no second chance. One strike and you are out. I think this system dates back to when China had way too many students and not enough colleges. It was a numbers problem and the best way to weed out 70 to 80 percent of the students was with one bone-crusher test. Whether it was fair to all the different kinds of students was not the issue. It served its function well, weeding out the weaker students and promoting the strong. If you were sick that day or your mother had died, it was just too bad, no make-ups. The TV talk show focused on a student that left the test to help a student beside him that had some health issue, seizure or something. He waited for somebody to help the student next to him and when that didn’t happen, he took her to the hospital. He never got the chance to complete the test and got a score of about 25%. After much hand-wringing the analysts decided that the student should have minded his own business and the system couldn’t make an exception for him no matter how extraordinary the circumstances. It was hoped that some university might find a use for somebody with humanitarian instincts, but little in terms of self preservation instincts. The lesson was clear . . . mind your own business first. It’s hard to understate what a big deal the Gao Kao is here in China. Construction is stopped on that weekend to avoid distractions. Honking of horns is forbidden, and so on. Some parents can be extremely unreasonable, with people demanding that elevators in tall buildings be stopped for fear of distracting a studying student. Dancing by old people is common in public squares at night . . .big trouble. It is said that the two most unreasonable kinds of people in China are mothers of children taking the Gao Kao, and old men who insist on playing their music and dancing in public squares, no matter what . . .
During review of this article it has been pointed out that the altruistic student who left the exam room a year ago has been offered several opportunities by credible universities, who do indeed appreciate his humanitarian instinct. Further, this year I learned that there was an exception to the policy for a couple students who had been hospitalized due to injuries they sustained helping others. More revisions to the system appear to be coming, even though it has taken a long time. A more user friendly system of testing may be on the horizon. The question of who is served by this system of public testing will be discussed, not unlike the issue of public education itself. Is the public education system set up for the benefit of the students and parents, or is it set up to benefit society as a whole? The students and parents may think that the system is there for their benefit, but that is probably not true. Increasing the public’s general education level is for the benefit of the society as a whole. Getting the best out of the available students is in the public’s interest. In the past, space in universities was scarce. Now, due to the one child policy and expanded university capacity, more good students are needed. The system designed to “weed out” 70 to 80 percent of the students may be discouraging some students, especially the “late bloomers”, those with unique or specialty interests, and those who happen to have had an unrelated crisis on the test day. As I see it, the question isn’t whether to change the system. It’s how do you tell the difference between a weed and a flower? A student’s enthusiasm is a terrible thing to waste.How to change the the world’s most massive uniform testing system? From Wikipedia, the free encyclopedia,en.wikipedia.org/wiki/Guizhou_Renhe_F.C. Guizhou Renhe Football Club (simplified Chinese: 贵州人和; traditional Chinese: 貴州人和; pinyin: Guìzhōu Rénhé) is a Chinese professional football club based in Guiyang, Guizhou. They play at the Guiyang Olympic Centre and currently compete in the Chinese Super League. Founded in Pudong, Shanghai in 1995, the club was originally known as Shanghai Pudong though they changed their second part of their name on several occasions to suit their sponsors. During the 2006 season, the club, which had named itself Shanghai International, would move away from Shanghai to Shaanxi and rename themselves Xi’an Chanba International, or Inter Xi’an by the fans. Before the 2012 season, the club moved to Guizhou, and changed their name to Guizhou Renhe. and shrimp, and a Turkish Pizza. We are in the housing development with the purple clock on the south side of Da Ying Lu. You go inside the development. It’s a great little place and serves pizza only Thursdays through Sundays. The rest of the week they make bread and prepare the ingredients for the weekend. The menu has an English translation. Delicious!